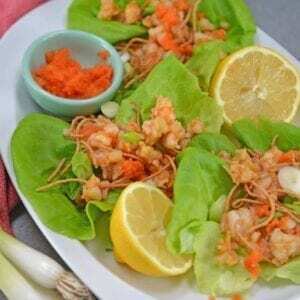 Ginger Shrimp Lettuce Wraps, made with sherry, ginger and garlic, are the perfect appetizer or entrée. Ready in just 15 minutes! Start by making the shrimp. Heat sesame oil in a medium skillet until nearly smoking. Add chopped shrimp, water chestnuts, fine sea salt and smoked paprika, cook for 2 minutes, stirring to prevent sticking. Add sherry, ginger and garlic. Continue to cook until shrimp are fully cooked and opaque, approximately an additional 2 minutes. Remove from heat and set aside. In a small container or bowl, whisk together all ingredients for the Vinaigrette, set aside. To serve, place all garnishes in their own bowl, as well as the vinaigrette and shrimp mix. Place all ingredients into a Bibb or Butter lettuce leaf and enjoy! Note: You can also choose to use Bibb, butter, romaine or iceberg lettuce.